The School will be hosted within the Department of Engineering and Management of Industrial Systems (DTG, www.gest.unipd.it), in Vicenza, a town in the North-East of Italy (30 min by train from Venice, less than 2 hours by train from Milan). Vicenza is both an ancient city, already important in the Roman times, and a modern city, fully open to tourism and commercial exchanges. 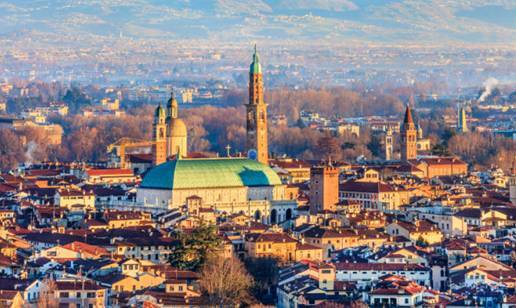 Vicenza is well known for the good weather especially in summer, the friendly people, the excellent cuisine, and its artistic relevance. The city counts with a large and diverse offer for lodgment. The city is completely flat. Walking, cycling along the city is very comfortable. Moreover, the city has a good public transport network which will allow the delegates to come to the university from practically any point in the city. The airports nearest to Vicenza are Venice Marco Polo (60 km from Vicenza) and Verona Catullo (50 km from Vicenza); both airports are served by many frequent international flights. From both Venice Marco Polo and Verona airport, it's about an hour's transfer (by bus then train) to Vicenza. Information on www.atvo.it and www.trenitalia.com. Vicenza station is on the main Milan-Venice railway link, served by numerous international trains. Trenitalia Le Frecce and Eurostar trains stop at Vicenza. Information on www.trenitalia.com. Vicenza is on the A4 (Milan-Venice) motorway, which is linked to the European motorway network. Vicenza has a wide range of accommodation, from luxury hotels to youth hostels. The estimated rates per night for single or double accommodation, breakfast included, are from 50 € to 150€. Some hotels are at walking distance from the Conference venue, whereas courtesy buses will be arranged from the others hotels to the Conferences venue. The Organising Secretariat cannot assume any responsibility for personal accident, loss or damage to the private property of participants and accompanying persons, which may either occur during or arise from the School. Participants should therefore take whatever steps they consider necessary as regards insurance.